Davell Crawford appears on "Live at Little Gem Saloon: Basin Street Records Celebrates 20 Years"
This year, the Grammy Award-winning record label Basin Street Records celebrates 20 years in business. On May 5th, BSR held an anniversary party at the historic jazz venue Little Gem Saloon with performances from legendary New Orleans artists. The set included performances from Jason Marsalis, Kermit Ruffins, Irvin Mayfield, Bill Summers, Dr. Michael White and Davell Crawford. BSR recorded the entire evening and chose select performances for a live concert album, Live at Little Gem Saloon: Basin Street Records Celebrates 20 Years. The album is set for release on November 23. Highlights include Jason Marsalis’ “Bourbon Street Ain’t Mardi Gras” and “At The House in Da Pocket”, trumpeter Irvin Mayfield’s collaboration with Kermit Ruffins and his band The Barbecue Swingers, Dr. Michael White’s “Summertime”, and Davell Crawford’s closing performance as the Piano Prince of New Orleans. Basin Street Records was founded in 1997 by Mark Samuels and Tom Thompson with a concentration on jazz, funk, and R&B. Offbeat has awarded BSR the title of “Best Record Label” ten separate years. 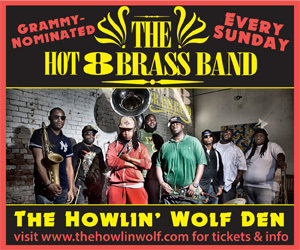 In 2012, Rebirth Brass Band’s Rebirth of New Orleans won the label a Grammy for Best Regional Music Album. Live at Little Gem Saloon is available now for Pre-Order on Basin Street Records, iTunes, or Amazon to receive two tracks instantly: “Bourbon Street Ain’t Mardi Gras” by Jason Marsalis and “Give It Up (Gypsy Second Line)” by Dr. Michael White.